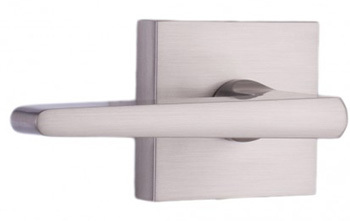 Available in Satin Nickel, Bright Chrome & Oil Rubbed Bronze. Easily accessible push-button locking functionality in rosette. Constructed with solid zinc rosettes and levers. Constructed using square spindle tubular design. Exceeds ANSI Grade 3 lock standards. A panic-proof privacy function allows for quicker egress when locked. Not available in Keylock function.